Catalonia is home to a significant innovation structure, production centres, very often connected with small and medium enterprises, that are innovating with competitive products on the international stage.The problem is the dispersal and lack of knowledge that this phenomenon currently suffers. The Connect with Innovation project aims to reveal the true situation across Catalonia. Innovation is understood as the application of new ideas, concepts, products, services and practices which are useful because they respond to a need, in the case of the product, or because they increase productivity, and so an enterprise's competitiveness. The acceleration of the change in ways of life in our current society is driven to a great extent by the innovations that are constantly emerging. Despite this reality, in almost all developed countries a paradox has arisen: scientific and technical professions are on the decline, being overtaken by the humanities and business careers. One of the reasons behind this phenomenon has been the limited social presence of such enterprises, and as a result likewise centres of innovation within the landscape of today's cities and urban settlements. Meanwhile, non-stop news items about relocations and the image of scientists at major innovation centres have conveyed the idea that little is being produced here, and that the innovations created are practically negligible. 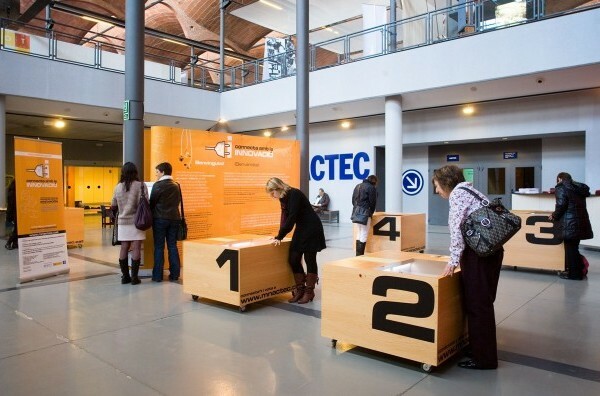 This exhibition is made up of six modular information units, each of them featuring a description of the research group that developed the innovation, documents and materials showing the evolution and research and the finished product, with the aim of contextualising capacity for research and innovation, and the implementation of this process through enterprises.